A very enjoyable evening at the French Connection Bistro in Stourbridge, now under the management of the enterprising Ross McGilliot, gave us a chance to see how fine wines endure the extremes of the modern day, British summertime climate. Considering that we sat outside with a cold beer to start with and the temperature was a stifling 39 degrees, it is not surprising that the whites, particularly the Champagnes shone, on this occasion. We often taste blind and a pair of Blanc de Blancs certainly baffled all and sundry. 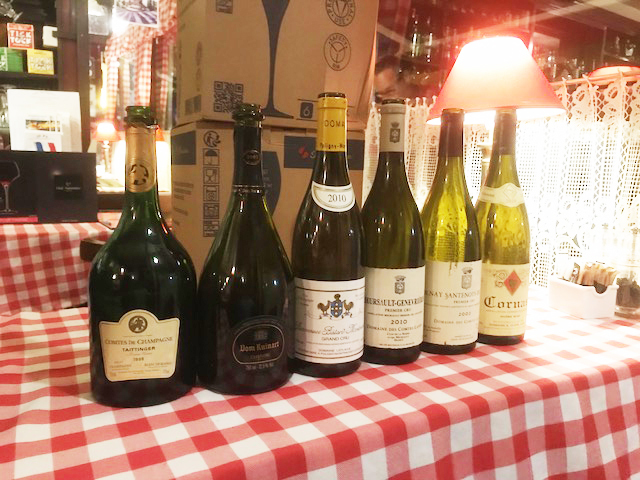 When comparing one tends to look for clues in the differences and they were there for sure, the first wine ‘Taittinger Comtes 1998′ was assured with obvious but not heavy evolution, Woody was on the right track suggesting the 1995 or 6 vintage. Callum picked up the Mocha and correctly detected it as a Blanc de Blancs but like me thought the second wine, Dom Ruinart 2002, was still heavy on the Chardonnay but with a good dollop of Pinot in the blend. This was more complex and luxurious than the Comtes but perhaps not as fresh and precise. Nothing between these beauties. For the whites the Genevrieres 2010 from Comtes Lafon was stunning right from the off and was not to be done down by the assumed superiority of the Grand Cru 2010 Bienvenues Batard from Domaine Leflaive which was not quite chilled enough and suffered a little, showing almost too much of a generous relaxed nature. Certainly impressively concentrated and complex but for sheer exhilaration the Meursault was beating it’s chest. The reds proved a little more difficult to decipher, I managed to recognise the first wine as a Cote de Beaune, but its definitive Pinot Noir character was far from obvious. It had a slightly deeper than average colour and seemingly youthful expression. 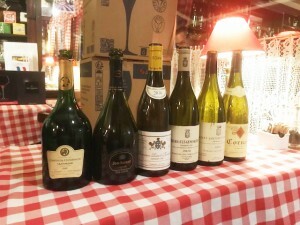 Comtes Lafon is more highly reputed for its whites, and that comment is justified, but this 2002 Volnay Santenots is obviously has longevity, and stood up well to the Parker 100/100 Cornas. The legendary Auguste Clape is a master of the Syrah varietal, and firm recognition of this grape variety was only really nailed by Dave who picked up on the black olive tapenade character, not to be dragged over to Bordeaux like most of the rest of us. With hind site it’s obvious and the aptness of the old adage ‘trust your first instincts’ was underlined here again. It could have been a big Merlot from Pomerol, hinted at by Rich, but from the warm terroir expression and the fact that Mark revealed it as a single varietal, we should all have been back over in the Rhone if not somewhere else more obscure. Thanks to all concerned for another fab wine night! Still quite pale here with golden hints, quite a delicate but pure nose, fresh with a hint of toffee caramel but just enough, still a bit of tannin here and extract/grip, salty even, spicy. There is weight and texture on the palate. Super balance. Enough softness to suggest a decent bottle age certainly 15 years ish. Marmalade coming through after a while of air exposure, very pure, not super acidic. This is a delicate wine, elegant, and particularly exciting on the finish, fanning our beautifully. I think this will show a bit more yet, but certainly in a happy place already.